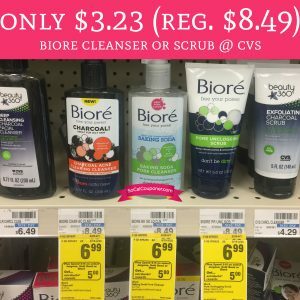 This week until 3/25 at CVS you can score Biore Cleanser or Scrub for just $3.23 each (regular $8.49). Right now these are currently on sale for just $6.99 each and spend $15 get $5 Extra Care Bucks. We also have a high value $2/1 Biore Cleaner or Scrub coupon found in the 3/5 Smart Source insert to score these for just $3.23 each! Final price $9.97 or $3.23 each!! “Like” our Facebook page to see all the latest deals. Want to share deals? Join our Facebook group to join a community of sharing deals, tips, tricks and fun!